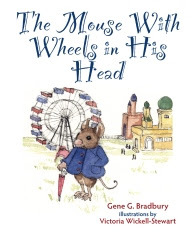 KidLit411 welcomes the very talented Gene G. Bradbury in the Author Spotlight this week. Gene is the author of many books for children. Tell us about your background and how you became a writer. I’ve always enjoyed stories, first told by my grandfather and listened to on the radio as a young boy. As an adult, stories were a big part of my profession as a pastor and teacher working with families. Listening to people in their homes, at work, in nursing homes and hospitals, a pastor hears stories every day. Sharing stories is part of living in a community. Writing sermons and curriculum is a large part of parish ministry. I began writing fiction and poetry as a way to process life experiences. The craft of writing came slowly for me, and only after many years did I begin to understand how difficult it was to have something published. There is a point in a writer’s journey when one must simply write because he or she loves to write. Like any skill, writing is something to be learned by practicing the art. For myself, success in writing for publication comes from long hours of work and many years of experience. My first real success outside of my professional contributions was an article published by Country Living Magazine. This was followed over the years by stories, poetry, and articles published in a variety of periodicals, professional journals, and children’s magazines. In addition to my years of higher education, I began to look for courses that would complement my interest in writing. I spent a week in a writing course with Madeline L’Engle, and a weekend with Robert Pyle, a Northwest writer. 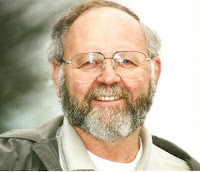 I sought out writing workshops and joined various critique groups. 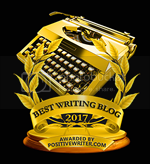 As I approached a time when I could devote more time to writing, I attended a week at Highlight’s Foundation and took additional online courses. Writing for children is a great challenge. Today’s picture book market requires much from a writer. 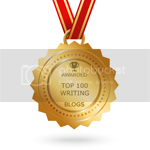 As one author told me, “An editor must sit back and say Wow! if your story is to have a chance.” There is great satisfaction in writing a story under 500 words that a child will read over and over. The hard lesson to learn is that not every story one writes will make the grade. Could you tell us a little bit about some projects that you have published? In addition to stories in magazines, I have self-published six children’s books, a book of short stories, and four books of poetry. My present projects involve primarily picture books. As a member of Julie Hedlund’s 12 X 12 program, I am revising old manuscripts and writing new stories. My immediate project for self-publication is a picture book to be published later this year entitled, THE KING'S BUTTERFLY. These projects keep me sane as I send other stories into the publisher’s netherworld to take their place in slush piles. But to give them credit, many of these editors are encouraging and I have been close to traditional publication on three occasions. What is your typical process for writing? My writing day normally begins in the morning. Should an idea come to me in the night, I may write at any hour. Story ideas come from anywhere and at anytime. When an idea hits I try to write a first draft as soon as possible. My first drafts are very rough. Then the real work begins. I will rewrite a story over and over, eliminating unnecessary words and clarifying details. When I think the story is close to completion, I read it aloud and make further corrections. My wife is gracious enough to do a first edit. Then it’s time to have other writers offer suggestions. 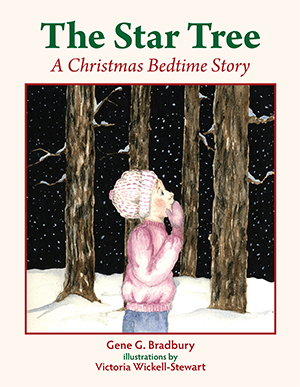 Critiques from others, especially those who write children’s picture books, is essential. When I think the story is as good as I can get it, I look for the appropriate place to send the story. The advice would I give to anyone wanting to write is: read widely, experience deeply, and write daily. In addition gain as much experience as possible, become a good listener, never pass by an opportunity to learn, and spend time with children. More information may be found on my writer’s blog at: scribblinglife.com and on my webpage genegbradbury.com. My books are available at Amazon.com. What is one thing people don't know about you? What people may not know about me is that I have a library of six thousand volumes in my home. Gene. G. Bradbury has been writing children's stories for thirty years. His experience in teaching children includes: churches, schools and retreats. His newest adventure is publishing children's books. He believes in stories that delight and educate children in positive ways. Congratulations on getting closer and closer to traditional publication, in addition to all your other accomplishments like being published in magazines and self-publishing, Gene! It was fun to learn about you and I wish you much success in the pursuit of a book deal! Your dedication shines! Congratulations on your publications, efforts, and focus. Keep that persistence and surley you will achieve your writing dreams. Enjoyed reading your comments here! Love your children's books and other writings, you are inspiring! Way to go Mr. Turtle. Slow and steady wins the race!